One of the not so hidden projects at the moment was to get some of my photos from Flickr and print them. The reason was a lovely man who works at Castle mall in Norwich had a free shop space and instead of leaving it empty he’s had it painted white and is giving it up free of charge to Norwich Flickr members to post up their own photos. The brief was to produce some photos of Norwich for all to see. The weather has been terrible recently so all of these photos had to come from the back stash that I have in Flickr. The lovely man, Rob is his name, asked the whole norwich flickr group, now 9 people have made the effort, to frame our photos and get them to him by Friday. Some have done Norfolk, some just arty shots, and some entirely just Norwich like me. My photos got there at lunch time today, I did 6 framed 14 by 11 inch frames with 10 by 7 inch prints in them. I must admit I did a really lazy framing job but they still look nice. I met Rob at lunch time and another of the flickr members putting up his pictures. I’m super excited by this and its the first time I’ve ever been hung in a gallery, in any form! This saturday night, for friends, family, us and anyone else who are well wishers are welcome to come along to the gallery open evening. From 6pm till 9pm at the back on the upper floor of castle mall. WOO! its a good start, I doubt I’ll ever get famous for it but at least I can say I’ve been in a gallery! Here’s a link to the 6 items I used. My theme: Look up look down in Norwich. A small foray in to alternative views of our city. I now have this as my desktop at work. I just wanted you all to see my lovely boys. They were great to me the whole week I was off sick. Since they have been in a bit of a mood because I’m not home all day. Last night I fed them cat nip which was hillarious, followed by fresh cod from the chip shop. They were very very happy after that and spent the rest of the evening hugging me and or Scotty. AW. lazy sods. most things are going better now. I’m almost back to normal. Working hard and enjoying having lots to do at work. I’ve done so many little things since or during my week off that I’m not sure I’m going to be able to put it all down here without drowning you in info. I cleaned the kitchen, damn it needed it. I took my time whilst I was off, it was worth it. The sinusitis is nearly gone. I cant say its completely removed. The antibiotics seem to have just about worked. I’m feeling more normal now. I spent most of the week dizzy and slightly queasy from the sinus infection. Most of it has gone now and I don’t have half as much whistling in my ears. Daddy came over on the Wednesday of last week which was lovely. We both cried our eyes out but it got a lot out in the open that we needed and I suddenly realised, mum would not want me to be so sad. No matter how much I miss her I need to get on and look forward. A hard lesson but now I truly feel it may have been learned. Saw the family on Saturday. We went over to Dad’s house. I got some lovely pressies. A loaf tin from Dad. A book on quick and healthy veggie cooking from my brother. Then some BEAUTIFUL yarn from my sister from the aplaca farm in her village. Plus a wedding book completed by her husband M, who took the wedding photos. It nearly made me cry it was that lovely. Sunday I woke up in a mood to cook. Not any ordinary cookery mood either. I nipped to the shops and stocked up on a few items to make sure I had what I needed. I started by making a veggie bolognese sauce with red wine for pies and pasta and kept some back for lunch with a puff pastry pie crust. The rest was stored for later in the week. Then I got all the root veg out of the fridge and did quorn chicken pieces and root veg stew with cider YUM and cheshere cheesy herb dumplings. This was dinner later. The rest of this also got stored. Then veggie sausage rolls to use up the puff pastry…Once all that was done it got to about 2pm we had lunch and I went for a nap. I was exhausted. When I got up the urge to cook was still with me. 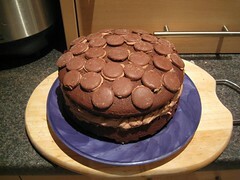 I then made deep chocolate Victoria sponge with cream filling and large chocolate buttons on top. 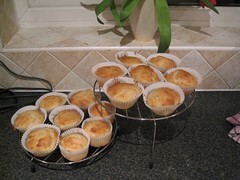 If that was not enough I then also made some lemon ginger and coconut cupcakes. Oh and Scotty made a loaf of bread. Really food for the rest of the week and cakes for me to take in to work. Monday, I took ALL the cakes in to work and they didn’t even last until lunch time. It was like gannets at my desk. I was very very proud of myself for home baking all the cakes and got so many great compliments. I did save a little back for Scotty but I’m just going to have to bake another one soon. Its his birthday too soon. I’ve spent most of my birthday asleep, I’m not well but I’m happy. 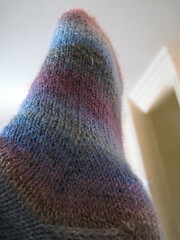 I finished my socks and washed them to wear today. Photos up soon. Party tomorrow, and AM popped past this evening for tea and biscuits which was lovely. She got me flowers!! YAYS! Thanks to all here and on facebook for the happy returns. I’ve got lots of great things to look forward to this year, thanks to Dad for reminding me of that. Plus we’ve had the cats a year today so I’ve played with them lots. I just cant wait to feel well, head still very spiny and very queasy. I don’t think the antibiotics worked but I’m glad I had the time off because I have been physically below par all week, mentally though, now I am happy and hopefully good for the foreseeable. where the world turns slightly upside down. knit night was great fun. Although it turned out nothing like it should do. AM, my friend called so I went to pick her up and go knitting. We spent over 45 minutes driving around trying to get parked in the forum car park. In the end we gave up and went home. This did not stop us still staying out an enjoying ourselves. I parked back home and we walked to hers. Had knitting time and home cooked pizza by her lovely husband. I was plied with a couple of beers which was nice but it also meant I nearly took the blurt all your troubles out route before I stopped myself mid sentence. Anyway it was a lovely evening and my friends are great at cheering me up. I went to the doctors Friday morning and tried to be as honest as possible. I had to mention work as well as home and the sinusitis and my emotions. We discussed the pill which is about the only thing going right with my body at the moment. Anyway he has plied me with antibiotics and nose drops that have to be placed in upside down. I discussed my current mood situation and he was properly understanding and said that its not worth giving me pills (thank goodness) he said it was like the early stages of depression but I would be best to speak to someone and take some time out to re-assess, catch up and place myself in a situation where it does not make me feel like I’m drowning just trying to catch up. He also explained that my sphenoidal sinuses were the ones infected which is why I’m getting tinnitus and dizziness and occasional queasiness. Here’s the shocker and I was thoroughly shocked when he said so, I’ve been signed off work for a week. I went home, called work and arranged it all. popped in to the office by car and gave in my keys and cleared all my work for colleagues to complete. I got home and did a little pottering about and knitted some socks. I’m still in shock now to have the time off sudenly left with time to think about what I need to do. I know I need to rest mostly and get well, I also need to think about why I feel bad, which also means what are my plans for the future and why do I feel so lost. I did tell my doc about this blog and he said its a good thing, so I’m hoping you good readers wont mind me going in to the whole thing whilst I go through it. I’m hoping it will help me, and you never know, keeping it public may help someone else. we’ll see. I may chicken out like I did with the honeymoon. I’ve still got 20 odd drafts from that. One thing I do know, If I had my health right now I’d find it easier. I do feel little like I don’t know where I’m heading right now but I need to either accept it or find direction to aim. These feel like they may be big life choices. So with Scotty by my side for support and someone to enjoy time with Saturday we gotout of the house and went and got a new microwave, cat food and a new shower head. All done within 2 hours and with little fuss. We nipped to Comet and found an ex display model reduced, then Scotty used some vouchers he got from work so we ended up paying £90 for a £250 microwave oven combi thing. Bargain! I woke up feeling a bit rough again on Sunday but I tried to shake it off so went shopping for pressies for me. why? cos its my birthday on Friday which I already booked as holiday. We stayed out for a lovely wagamamas lunch and Scotty got me some chilli chocolate, a knitting book and a ghibli film. Once we got back I collapsed and had a nap. The cold had got to my sinuses and it felt like someone had a vice grip on my head. Today trying to sort out what I am about. I’ve got a feeling some lists are coming on. What needs to be done, what I want to do, what takes time. what I can accept, what I cant. One thing is true, I’m not going out in that snow today. Its beautiful but I cant risk the sore head. You are currently browsing the Jiva a soul in transit blog archives for February, 2009.